Image: Nanjing Memorial People participate in a ceremony at the Nanjing Massacre Memorial Hall on the second annual national day of remembrance to commemorate the 80th anniversary of the massacre in Nanjing on Dec. 13, 2017. Image: The executed bodies of Chinese civilians and soldiers cover the ground as Japanese soldiers stand in the background. The executed bodies of Chinese civilians and soldiers cover the ground as Japanese soldiers stand in the background after a battle to take Nanking — now Nanjing — in 1937. Image: Nanjing Memorial People participate in a ceremony at the Nanjing Massacre Memorial Hall on Dec. 13. A somber President Xi Jinping led a nationally televised ceremony to remember the estimated 300,000 Chinese who died when Japan’s Imperial Army occupied Nanjing, then China’s capital, 80 years ago. A postwar international tribunal put the death toll from the massacre at 142,000, while some conservative Japanese politicians and scholars deny that one took place at all. Ties between China, the world’s second-largest economy, and Japan, the third-largest, have also been plagued by a territorial dispute over islets in the East China Sea and suspicion in China about efforts by Japanese Prime Minister Shinzo Abe to amend Japan’s pacifist constitution. Wednesday’s conciliatory message, delivered on the occasion of the most brutal episode in Japan’s invasion of China, was not lost on observers. “The decisive factor, however, is that conflict is too costly for both sides,” added Shi, who supports “new thinking” for better relations between China and Japan. The diplomatic signaling that emerged from the Nanjing ceremony merely represents “a continuation of a process,” he said, pointing out that the turning point in relations may actually have been Japan’s endorsement of the Belt and Road project, Xi’s signature economic program to link Asia with Europe, the Middle East and Africa. A breakthrough was then apparently achieved in November when the country’s two leaders emerged from a meeting on the sideline of a regional summit in Hanoi to declare “a fresh start” in the relationship. Noting the debate over whether Japan’s apology for wartime atrocities is sincere, Yuan Gang, a government professor at Peking University, argued that “history should not be an impediment” to developing relations. “Are you requiring the Japanese to kneel?” he asked, stressing that Japan supported China’s open-door policy and economic reforms. 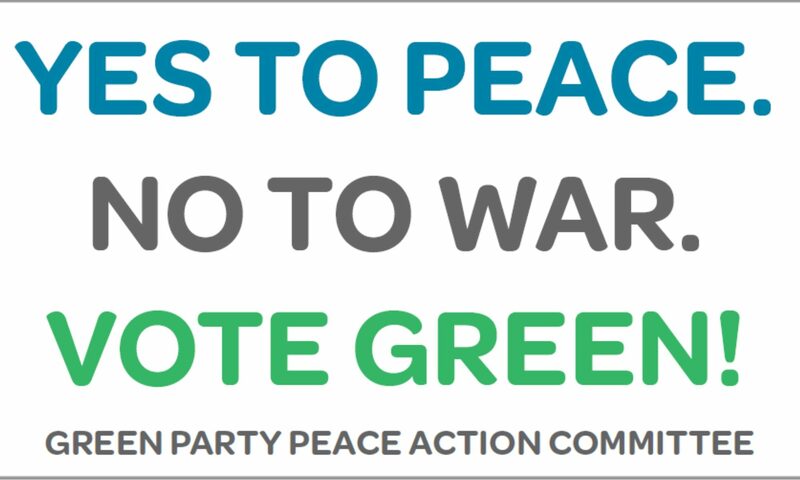 WASHNGTON, D.C. – The Green Party’s Peace Action Committee (GPAX) calls for the development of alternative solutions to violence on the International Day of Peace. GPAX, an official committee of the Green Party of the United States, has chosen Sept. 21, the International Day of Peace (“Peace Day”), to announce its reorganization after a hiatus of several years. “President Trump’s belligerent speech in front of the United Nations General Assembly on Tuesday, with his appalling assertion that the U.S. would ‘totally destroy’ North Korea, show how urgently we need a strong movement for peace. The Green Party exists to represent the movement in the political field by an alternative to the two war parties,” said Rich Whitney, GPAX co-chair and Illinois Green Party member. “Mr. Trump’s threats, which blatantly violate the U.N. Charter, are unfortunately consistent with invasions and attacks launched by the previous two administrations against Afghanistan, Iraq, and Libya, and with U.S. aid for assaults by Saudi Arabia on Yemen and by Israel on Gaza,” said Mr. Whitney. Greens said the U.S. Senate vote on Monday for a massive increase in the military budget to $700 billion, approved with bipartisan support, and Democrats’ enthusiasm for a new Cold War with Russia are further evidence that a revived peace movement is necessary. Peace Day was founded in 1981 through a U.N. resolution. GPAX exists to facilitate the planning and achievement of peace and justice actions of the Green Party and to support and promote the party’s anti-war candidates and agenda. “We recognize that peace is not just the absence of violence, it’s a willingness to resolve conflict in a constructive manner and to develop alternatives to society’s current patterns of violence,” said Rita Jacobs, member of GPAX and the Green Party of Michigan. “We believe that nations should prepare for peace, not violence. The achievement of peace can only be realized through practices that lead to economic justice, universal nuclear disarmament, sane defense spending, international cooperation, and human rights,” said Deanna Dee Taylor, GPAX co-chair and member of the Green Party of Utah.